Amazon means well. They really do. Their main intent, of course, is to make money, and make no mistake they are very good at it. How do they do it. For starters their website is set up so that it remembers everything you look at. From there, it matches other music you might not have heard to items you have viewed to introduce you to more music, which you will hopefully buy. That's the tactic, and it works on me. Shame to admit, but it does. Sometimes I use this tactic to find music i might like. I was looking up the soundtrack to Angels and Demons, and then stumbled upon two items that caught my eye. 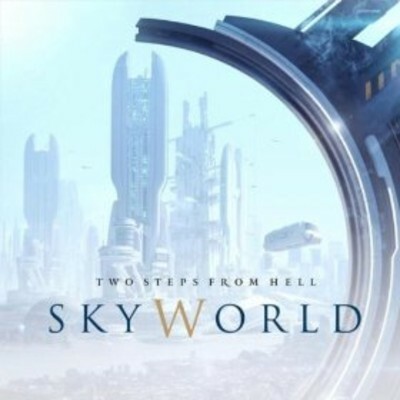 The first thing I saw was the shimmering artwork for Two Steps from Hell's"Skyworld". I listened to some of it and started digging for information regarding this artist. Two Steps from hell is a music production company from the greater Los Angeles area. Their focus seems to be primarily making music for film trailers. Just this year they have released a public album comprised entirely of brand new music. This music is grand, epic, orchestral music that is basically made for film. Throw out every preconceived notion of what recorded contemporary music might sound like, because this artists smashes these boundaries with a profound studio effort that will go straight to my collection as soon as possible. Within the first few bars of "Skyworld"s opening track, my jaw was picking up lint cat hair from the floor. I highly recommend this music. Stay tuned for a full album review when I get the chance to listen to the whole disc. For now, here is Titan Dream. My second discovery was that the new soundtrack to The Dark Knight Rises has been released. Hans Zimmer returns to the fray to compose the music for the third new Batman movie, and is impressive as always. It seems that official full tracks are hard to come by on the Internet, but I did manage to pull this track from YouTube. I have not checked the track listing on the soundtrack for this, so who knows if this track is part of soundtrack or not. However, if this is but a taste of what the soundtrack offers, count me in. Just a few more dollars of mine to Amazon's coffers. They are so good. Either I'm terrible or my love for music transcends money. Thanks for reading and enjoy!